The new Jaguar XFR sedan is so powerful that, slightly modified to improve aerodynamics, it reached 225.675 mph on the Bonneville Salt Flats. That makes the 2010 XFR the fastest production Jaguar in history, surpassing even the exotic XJ220 mid-engine supercar, named in the early 1990s for its target top speed. 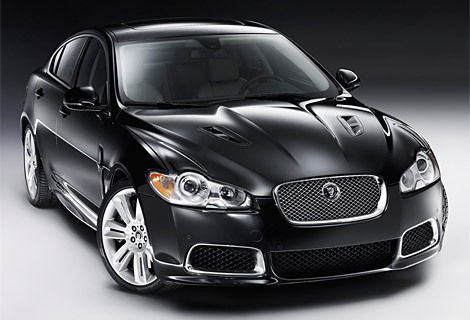 The XFR is the ultra-high performance version of Jaguar's standard XF sedan, which was widely greeted as the best all-new Jaguar in years when it debuted in 2008. The 2010 XF retails for $52,000 or $57,000 for the XF Premium model. Jaguar says the 2010 XFR will have an MSRP of $80,000 when it hits the roads this summer. The 2010 XFR will be available for order in February 2009, with the first deliveries expected this summer. Its purpose is straightforward: To give Jaguar a true luxury sedan with the performance of an exotic sports car and a no-excuses competitor for sedans such as the Audi RS6, BMW M5, and Mercedes-Benz E63 AMG.